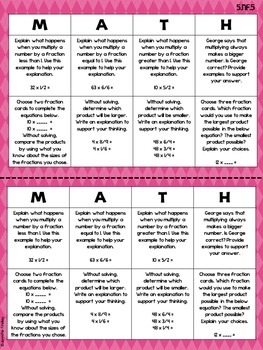 This resource contains 7 mini choice boards (2 on a page) for each Number and Operations: Fraction standard for 5th grade. These choice boards are available in two formats: with and without a colored background. Each mini choice board contains 8 tasks for the students to complete independently. 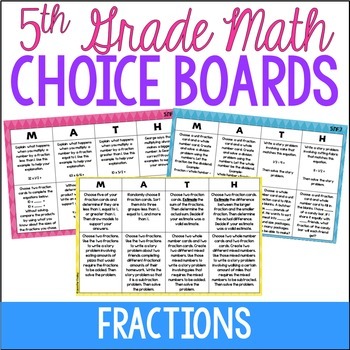 The choice boards could be used for homework, independent work, or math centers. The only materials needed are the fraction and whole number cards found on pages 3-7. 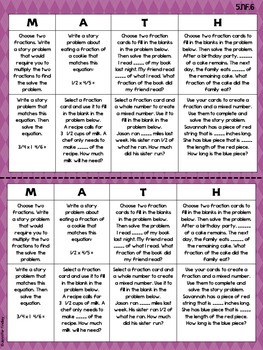 You can choose to print all 4 of the fraction pages or select only the pages of the fractions you want them to use to practice. However, I suggest printing at least 2 pages to provide for a greater variety of denominators and unit fractions (needed for 5.NF.7). 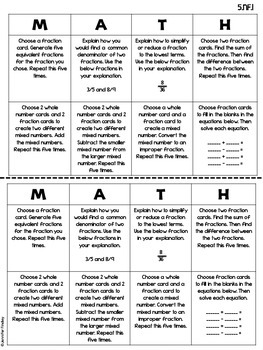 They will need the fraction cards and whole number cards to complete some of the tasks. Also for 5.NF.7 they will need to know that unit fractions are fractions with a denominator of 1, so they will choose the correct fractions for these tasks. Due to the nature of the activities, no answer key is included.